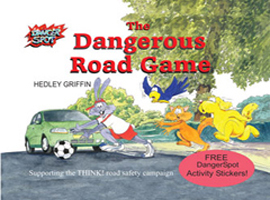 Children's Road Safety picture book,'The Dangerous Road Game'. To view the last 14 pages from the book pdf just click on the book cover below. Every day in Britain, eight children and young people (aged 0 — 19) are killed or seriously injured on foot or bicycles. Could many of the children killed and injured on the roads have avoided these accidents if parents and teachers paid more attention to child safety? With a little more thought and time spent teaching children about road safety some of these injuries might have been avoided. This book about road safety for kids might help. A children's picture book about child road safety ks1, and accident prevention, which also includes the Green Cross Code. He and his friends then cross over the road to play in the park. Harey kicks the ball into the road. He then runs after it without looking and is knocked down by a car, but just survives with bad bruising because the car was not travelling fast. 32 pages, full colour, including sticker page with six stickers.